Beautiful opulent interiors, live Middle Eastern Music, option to njoy ur evening in an open air cabana that is weather proof or in the plush interiors, excellent service & impressive food. Meal for 2: Rs. 3000 onwards. I rate all the food items & then give a final overall rating which is a simple average of the individual item ratings. What the ratings stand for : 5 = Excellent, 4 = Very Good, 3 = Good, 2 = Fair, 1 = Disaster. For the uninitiated, Casablanca is a city in western Morocco, located on the Atlantic Ocean. 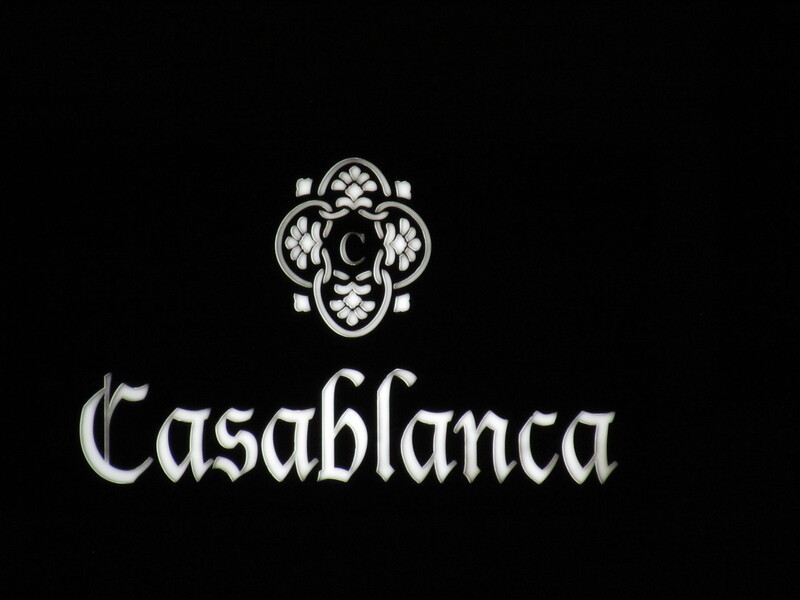 It is the capital of the Grand Casablanca region. The Latinized name of the city is a Spanish word combination meaning “White House” (blanca “white”, casa “house”). 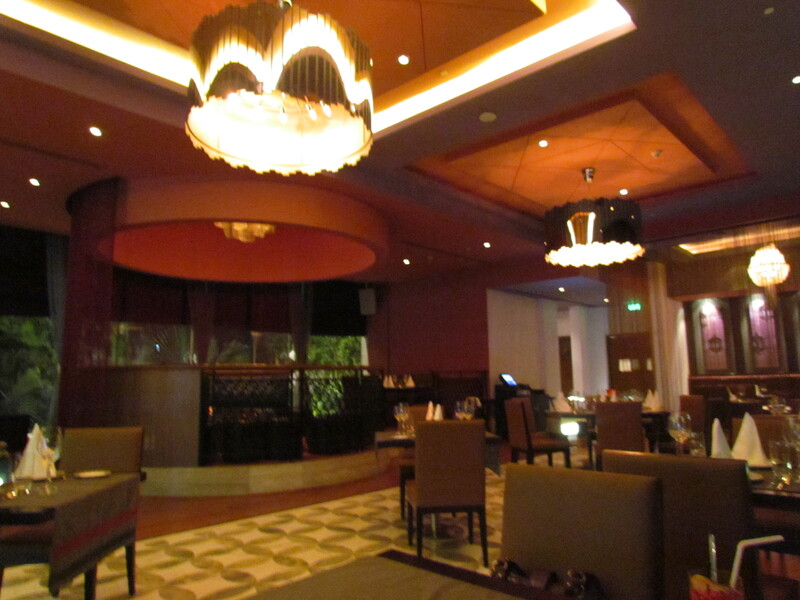 As soon as we entered the restaurant building, we were stuck by the beautiful decor full of opulence and grandeur. It all started from the Grand intricately carved wooden door, the beautiful Royal sofas & chairs in the waiting area & till the huge Dining Hall. Huge but beautiful Madeira dispenser in the middle of the Dining Hall was an eye-catcher. 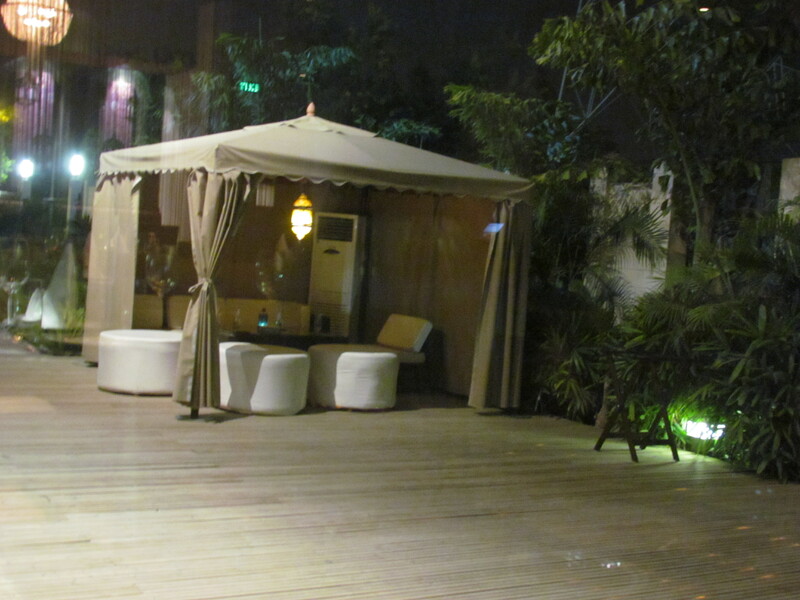 In addition to the hall seating, there were outdoor Cabanas that cud accommodate upto 10 people each. However on prior booking u can have a cabana all to urself – Good option for a romantic evening out. The good thing is that inspite of being outdoors, the cabans are weather proof – They have air cooling vents for summers & heaters for the winters. 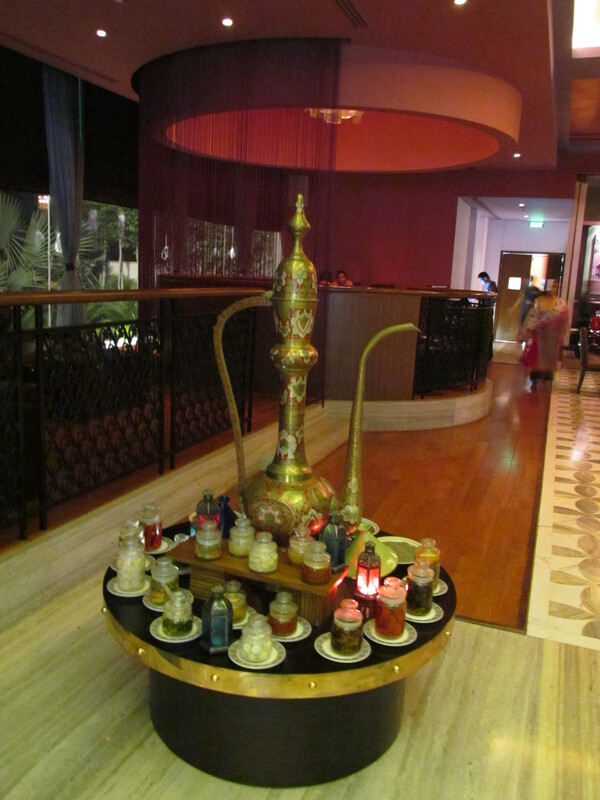 When we reached the restaurant, Moroccan song remixes & instrumental was playing. They were Fast, peppy & good to hear. 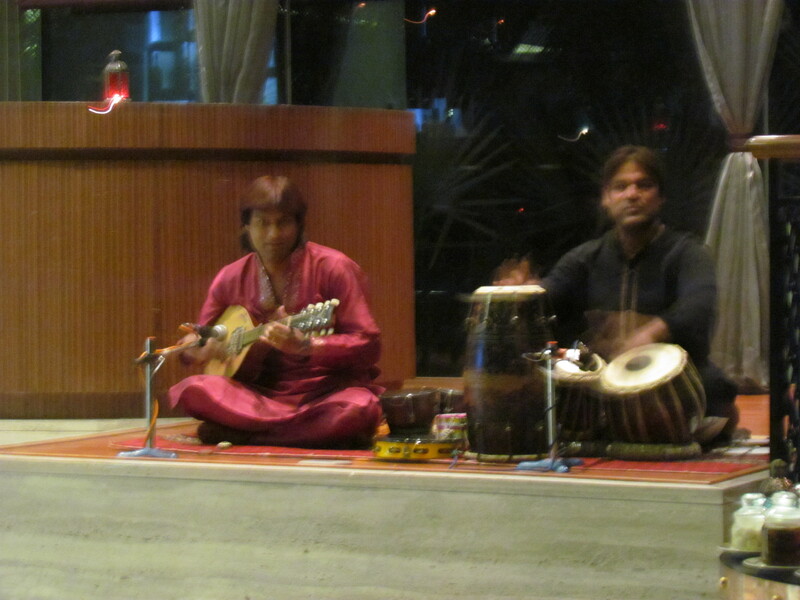 Soon after, Live music started – played by 2 guys, this was a super experience. They were playing Middle Eastern String instruments as well as drums. Tabla was also used at times. They started playing Moroccan tunes and slowly moved into Bollywood tunes. Service was outstanding & the guy Jitender serving us made us feel as if we were guests at his home. It was beyond ‘the traditional white gloved service’. He was a very good speaker & guided us well thru our choice of food. Must admit that he successfully & satisfactorily answered most of my queries in the 2.5 hours of our stay in the restaurant. Light was very dim & hence inspite of best of my efforts, I cud not click as much lickilicous pics of food as I am usually used to. 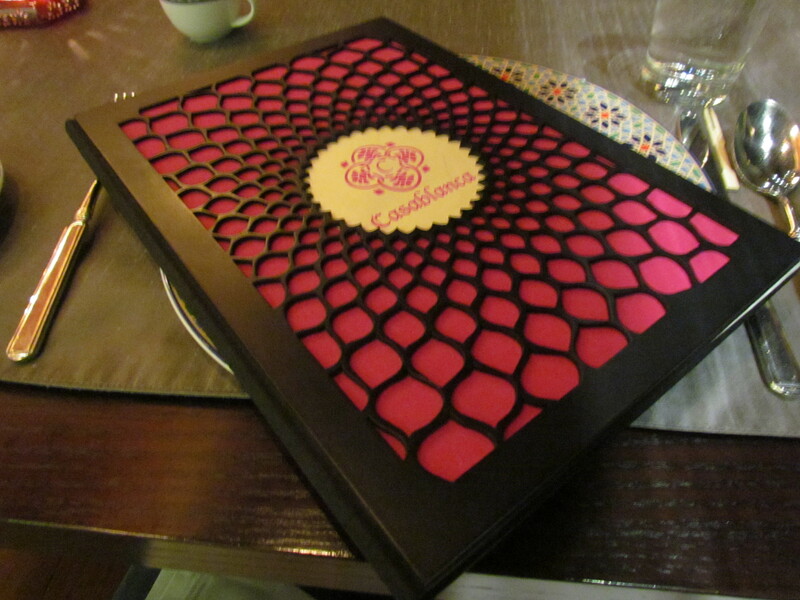 The menu card was a work of art in terms of sheer looks. Detailed description & story telling made it even more interesting. Food was very enjoyable as well. In general the food was not oily (from appearance), spicy but not that hot. Good spices quality made their presence felt. A Date bowl came as soon as we were seated. The waiting staff offered dates to us – we were supposed to pick dates up with tiny wooden forks. Small cups full of orange blossom flavoured milk were served alongside. The dates were supposed to be dipped in the milk & had. The dates had almonds in the center & were just awesome. One of the best dates I have had in Gurgaon in a while. The almonds were perfectly roasted. The thick cold flavored milk was a marvel – It was mildly sweet & intensely flavored. Loved this. Though this was complimentary, I wud rate it as 4.5/5 due to the sheer greatness of the item & also due to the sheer delight that came from this unexpected marvel. 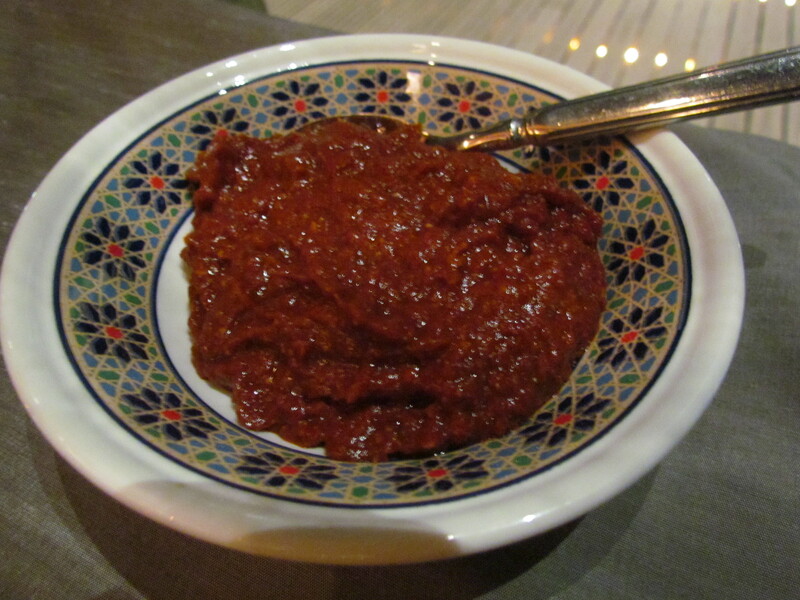 They also served us Moroccan bread & Harissa, an excellent red chilly dip – Hot, flavorful & unputdownable. Loved this one. 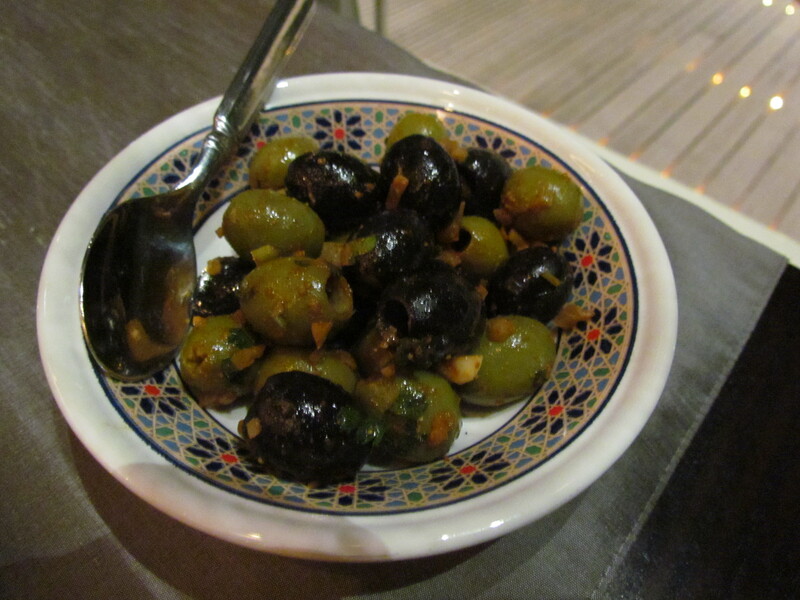 Olives served in a bowl were very good to munch on as well. 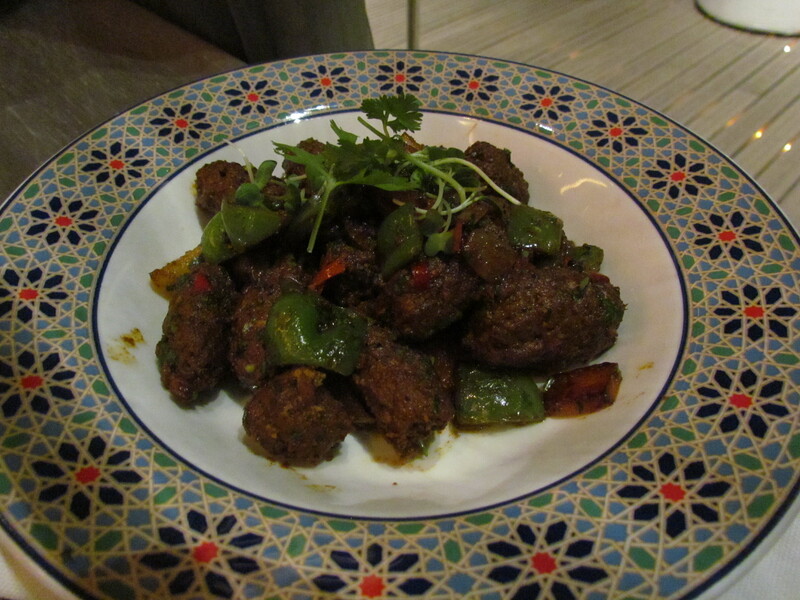 We started our evening with ‘Homemade lamb sausage’ Merguez with bell pepper. The sausage was made with machine minced meat . I am sure the home version of merguez wud taste juicier and more intense than this – machine mincing can never get the same effect as hand mincing / hand pounding. Try making keema kaleji with hand minced mutton vs machine minced………. U will know the difference. Machine made mince is bit more grainy, less intense & less juicy as compared to the chunky hand-made version. 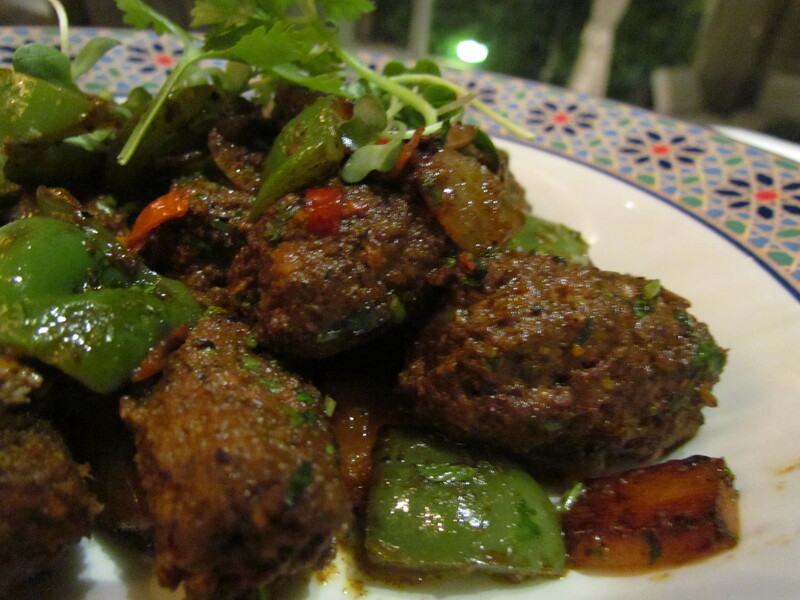 The spices used in the sausage (more a kabab than what we commonly know as sausage) were pronounced but not overboard. They were perfectly enjoyable. The sautéed bell peppers had acquired the flavors of spices as well. The sausage was not juicy but intense, spicy, somewhat hot & tasty. I wud have rated this dish at 4.25/5 but for the reasons mentioned above, I rate it as 3.5/5. 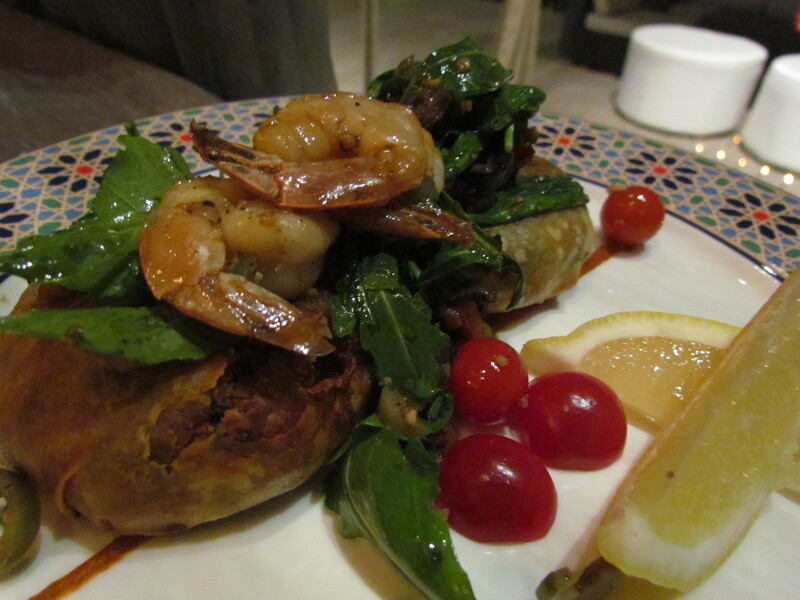 The second dish that we had was pastilla – ‘Traditional Moroccan dish that combines sweet & savory flavors. The meat is slow cooked in broth with onions, herbs & spices , then shredded & chilled overnight. The mix, eggs & toasted almonds get enclosed in a crispy layer of phylo pastry before topping with powder sugar & cinnamon’ said the menu card. We chose the shrimp, rice vermicelli, spiced tomato sauce combination. Logically the fun wud have been to have this dish in lamb / beef, the way it is described in the menu. What was offered instead was chicken & shrimp. In absence of a better choice, we chose shrimp. We might have missed on the real fun of the process but what we got was a very tasty & enjoyable dish. 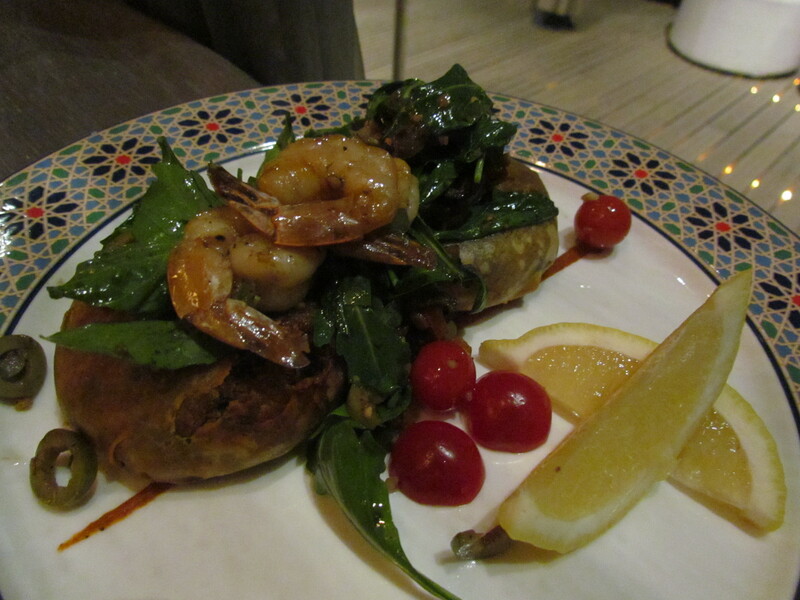 The prawns were done perfectly – soft, juicy, tasty & great. The phylo pastry looked somewhat like a khasta kachori from outside. It had a thin slightly layery crust that was super crisp. It reminded me of Indian samosas that I had in Hongkong several times. 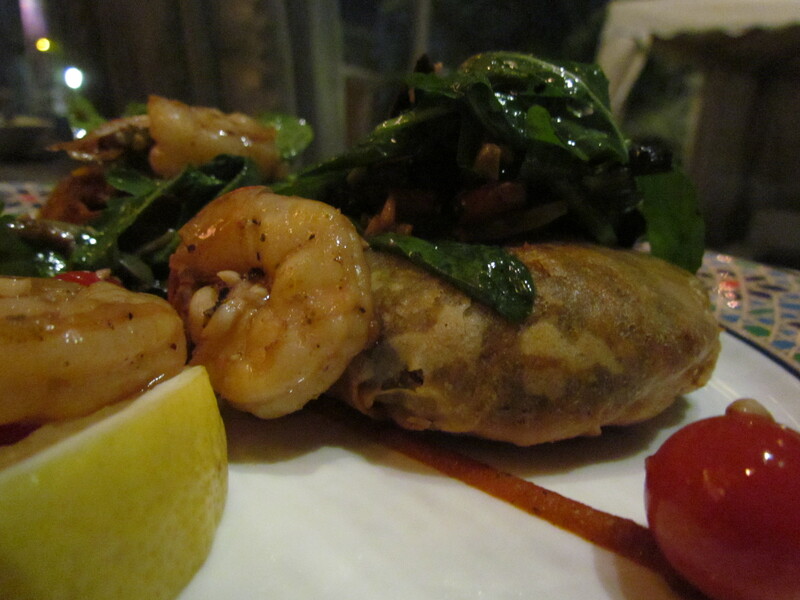 The filling was outstanding – intense , spicy, not hot, immensely flavorful & just too good. Loved this dish & wud give this a 4.5/5. 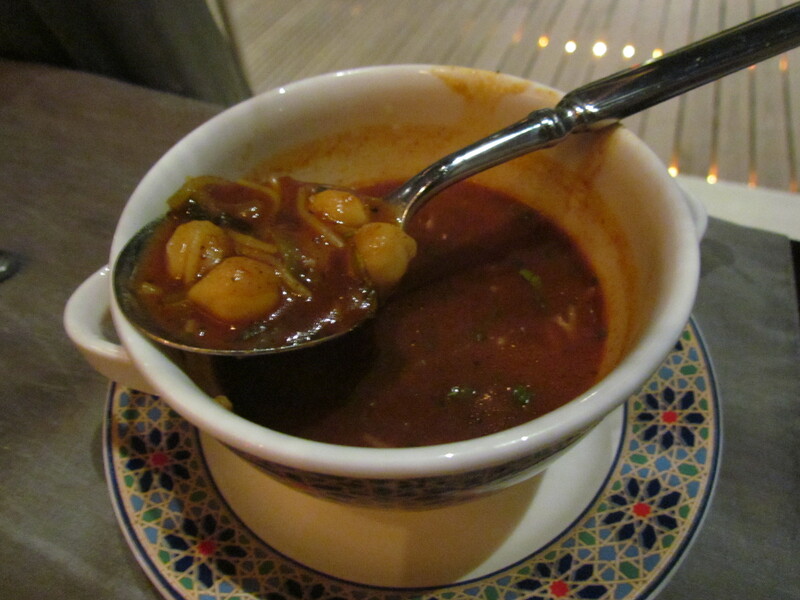 Tagine – ‘Tagine in Moroccan cuisine is slow cooked, stew braised at low temperature, resulting in tender meat that is then served with aromatic vegetables & sauce. They r traditionally cooked in tagine pot. All tagine are served with steamed couscous/ Moroccan bread / steamed rice.’ There were options of seafood tagine, rabbit, veal, chicken, lamb quail, vegetables. We chose the traditional one – Lamb. 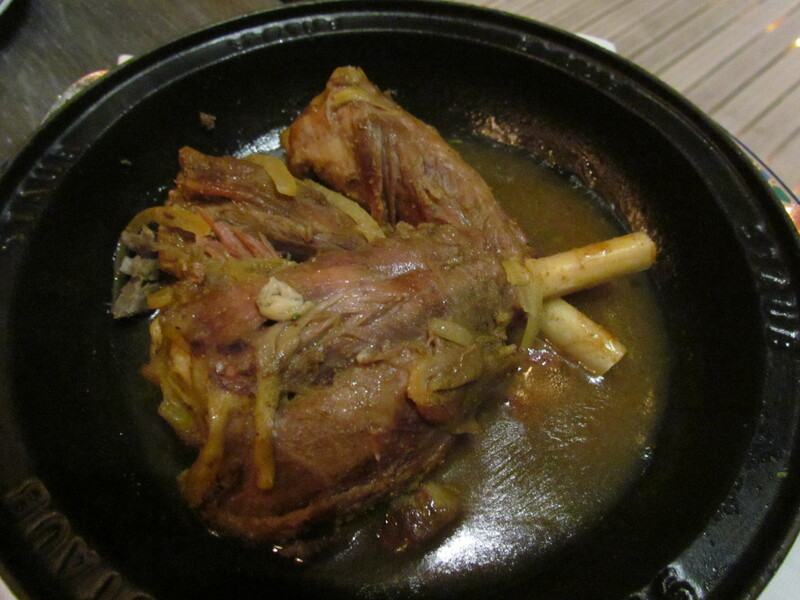 It was made from lamb shank & had ingredients like saffron, preserved lemon & cumin. The meat was outstanding – it was falling off from the bones, had intense flavor of meat infused with that of spices, it was soft & really tasty. Seldom does one come across a meat preparation so tender. Super loved it & I rate this at 4.75/5. 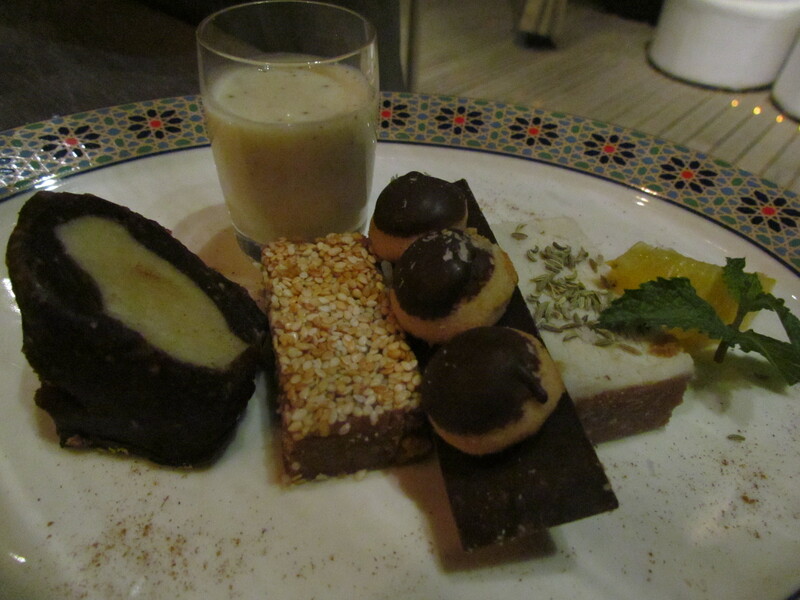 For dessert we had Moroccan sweet platter – Sellou, chocolate dates, Mkawara & some excellent flavored cold milk. For the uninitiated, Sellou is a unique unbaked Moroccan sweet made from toasted unhulled sesame seeds, fried almonds and flour that has been browned in the oven. Packed with calories and nutrients, it’s traditionally served during Ramadan and after childbirth, when there’s greater need to restore energy and maintain good health. 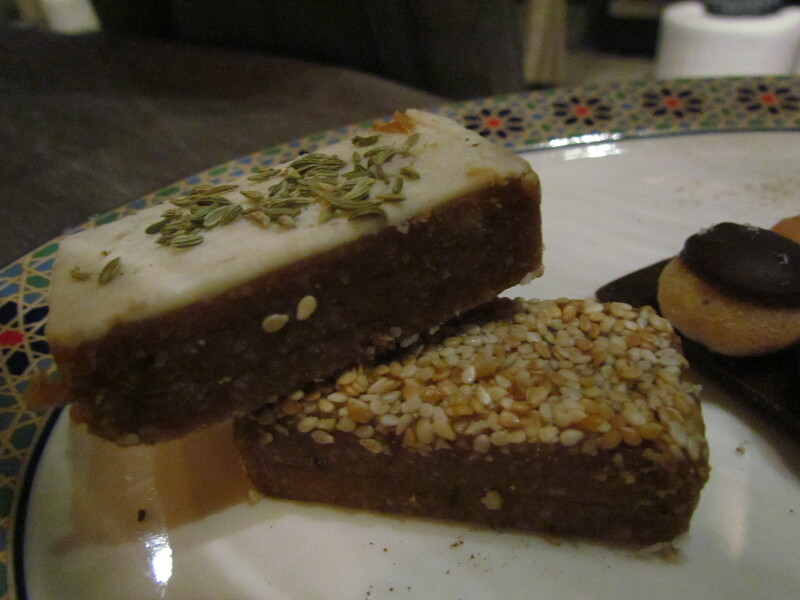 This was presented to us in 2 flavors – sesame & fennel seed. Loved the one with sesame – roasted sesame to b precise. The roasted sesame formed a somewhat crispy top layer & added a twist to the taste. It was also flavored with orange blossom. Fennel seed sellou was good but not as good as the sesame one. I give the sesame sellou a 4/5 & the fennel seed sellou as 3/5. Chocolate dates were good as well in general but not new. I give them a 3/5. The cold flavored milk was awesome. It was thick, had a strong understated flavor to it & very balanced sweetness. I give it a 4.5/5. 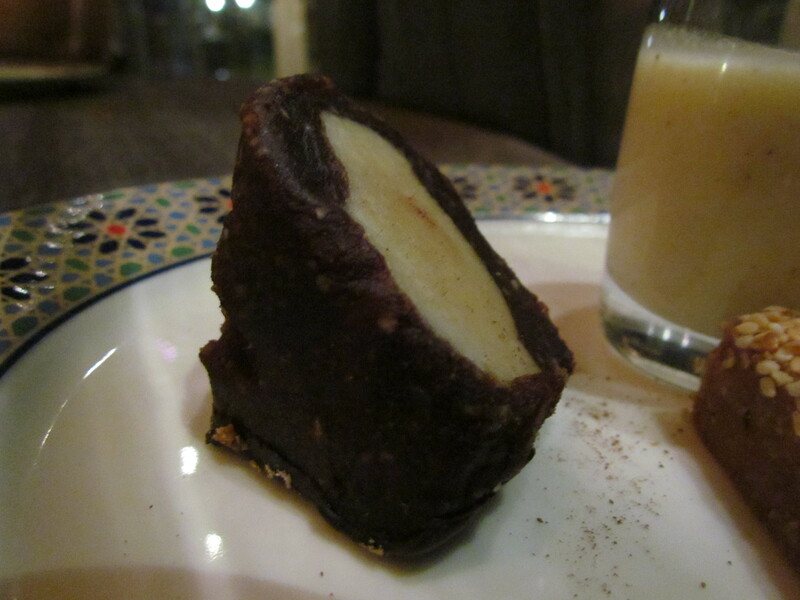 What stole the show was date made into a paste, cast into a hollow cylinder shape & filled with almond paste. Absurdly great. I give this a whopping 5/5. Dessert adds up to 3.9/5. Overall rating for food averages out to 4.2/5. I wud surely revisit this place / recommend to friends. Let me know how u find this place. Traditional pastilla has to be made with pigeon meat. Did they have that as an option? I do not remember:) Have to chk next time….